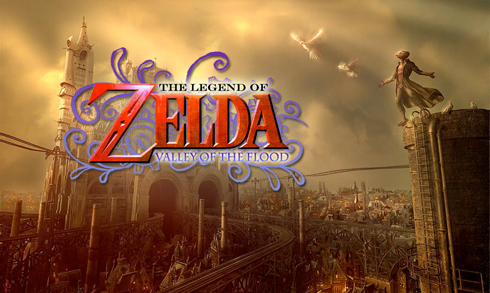 I want to take the logo from the image below, (the part of the image "ZELDA" with all the squiggly purple designs around it) and I want make it into just a white background with the logo on top of it. So, in short, i want to remove the picture with the buildings and stuff from the back of it, and just keep the straight logo with a white/transparent background. Now, since i am very new to GIMP, I was wondering if someone could explain the simplest way possible of accomplishing this task, because honestly, i don't know where to start. Any help will be greatly appreciated! Thank you so much! This is an example of how i want it to look after its done. ^ Obviously, it will be the other logo instead of this one. I'd say the most precise way would be to use the pen tool to crop out just the logo. Hmmmm.... yeah, I guess that seems like the best way, although I was hoping not to have to due to the time it'll take. I'll post my results when i finish. Thanks for the process ofnuts! But i am not quite sure how to do it. I just started using GIMP, so I'm a little comfused. I guess my first question would be, how do i add a layer mask using the blue channel? EDIT: If this is not a very time consuming process, do you think you could do a few of the steps to show me how it looks?